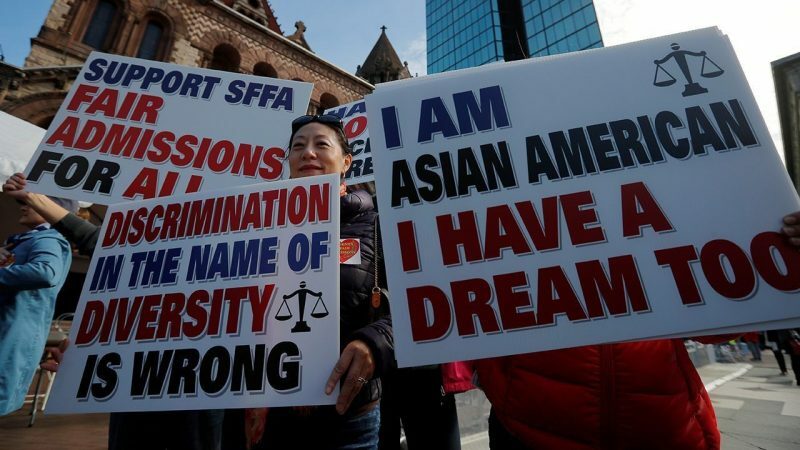 Supporters attend the “Rally for the American Dream – Equal Education Rights for All,” ahead of the start of the trial in a lawsuit accusing Harvard University of discriminating against Asian-American applicants, in Boston, Massachusetts, U.S., Oct.14, 2018. The lights are dimmed and the stage is set for a showdown between Harvard University and an anti-affirmative action group, Students for Fair Admissions (SFFA). One of America’s premier universities stands accused by the nonprofit for discriminating in its admissions practices by implementing a quota system that limits the number of Asian-American students it accepts. As part of Harvard’s “holistic” approach to admissions, the college considers individual characteristics alongside grades and test scores. While Asian-Americans are statistically stronger in extracurricular participation and academic achievement, SFFA attributes their lower personal ratings to racial bias. Additionally, Burroughs’ ruling, which is unlikely to be handed down until the spring, may have an impact on the autonomy of private universities. “Unlike previous such legal challenges that focused on public colleges, this one contests the independence of a private institution to set its own mission and standards for admissions,” stated an article from The Boston Globe. Proposed solutions to bias in admissions do not have to eradicate affirmative action entirely. Previous cases have resulted in refinement of the policy, trimming some controversial parts while still protecting the concept. “Burroughs could suggest remedies, such as more training for admissions officers or tweaks to the process that would address any potential bias,” The Globe reported. The Harvard trial may raise new questions about affirmative action, but several past trials still function as precedent. In a monumental 1978 Supreme Court case, Allan Bakke, a medical school applicant, sued the University of California for giving minority applicants preference. However, court dynamics have changed as a result of Trump’s appointments of Neil Gorsuch and Brett Kavanaugh. As the restriction or complete abolishment of affirmative action is generally considered a conservative cause, current conditions may lead the court to hear the case and potentially rule against affirmative action. Though the Harvard case may be the most publicized attack on affirmative action at this time, Asian-American advocacy groups have also filed claims against the California university system and University of North Carolina Chapel Hill. In addition, Yale University is subject to investigation by the Justice Department on similar grounds of discrimination. Support for affirmative action is not divided along purely racial lines. While many Asian-Americans feel disadvantaged by schools’ efforts to create diverse student bodies, others feel they are being used as a tool for white supremacy. Some question the relevancy of this case considering that Asian-Americans comprise a much larger percentage of Harvard students than of the United States’ population – 5.6 percent. Harvard’s diversity would be adversely affected if the case resulted in the removal of race as a factor in its admissions. But the FFSA argues that Harvard’s desire for diversity is racial molding and does not justify limiting the interests of any individual. Photo courtesy of Reuters/Brian Snyder.